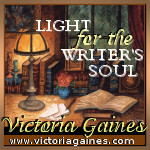 Friend and fellow writer and blogger, Victoria (Vicki) Gaines, posted the following quotes on her excellent blog Light for the Writer's Soul recently. Vicki has experienced life with all it's joys, trials and disappointments and is an excellent writer...and prayer partner. Reading her work lights a fire in my bones to write more, write better and write often. Thanks, Vicki, for your inspiration!